The vivo X9 and X9 Plus are expected on November 16 and someone is already putting up promotional posters for the upcoming selfie-obsessed duo. The vivo X9 has a 5.5” 1080p screen, while the X9 Plus goes bigger at 5.88” (still 1080p resolution). The two differ in battery size too - 3,050mAh for the smaller phone and 4,000mAh for the bigger one. Both will be powered by the new Snapdragon 653 chipset - a slightly overclocked version of the 652 with a faster modem (up to Cat. 13). 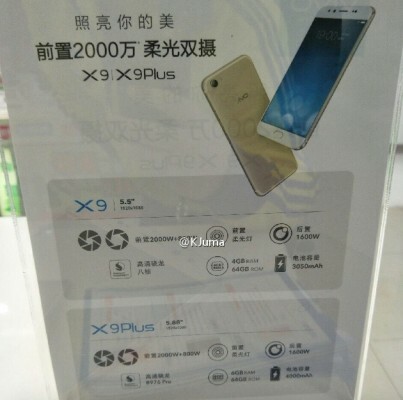 The smaller X9 will have 4GB of RAM and 64GB storage, while the bigger X9 Plus ups the RAM to 6GB. Don’t expect the latest Android though, 6.0 Marshmallow is what you’ll get at launch. The X9’s claim to fame is the dual selfie camera - 20MP + 8MP. On the back is a single 16MP camera. It's not yet 100% clear what functions the dual selfie cameras will serve, our money is on a wide-angle lens for group selfies (B&W selfies are a possibility but then why the wildly different resolutions). Vivo good Y55L. Good good.